Screen shot of part of criminal complaint filed today. 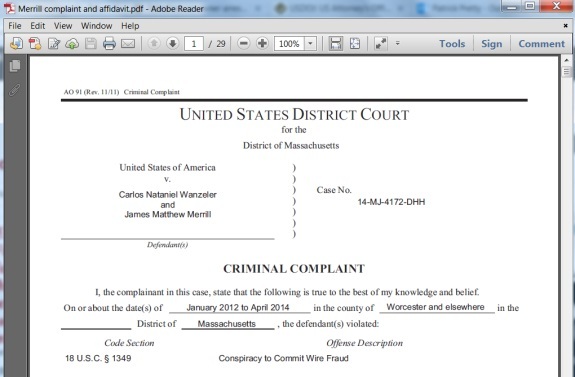 BULLETIN: (18th Update 8:15 a.m. EDT, May 10, U.S.A.) TelexFree figures James Merrill and Carlos Wanzeler have been charged criminally with conspiracy to commit wire fraud. In similar prosecutions, U.S. authorities have notified INTERPOL about the subjects of U.S. arrest warrants in HYIP cases. How authorities intended to proceed against Wanzeler was not immediately clear. An analysis of the bank and credit card processing accounts behind TelexFree’s publicly-stated income and revenue figures shows that TelexFree was deriving less than 1% of its revenue from its VOIP products, about 99% from investments by new promoters, and that it could not meet its massive payment obligations to existing promoters without equally large infusions of cash from new promoters. The complaint, among other things, reveals that an undercover probe into TelexFree was under way before the company and certain arms filed for bankruptcy protection in Nevada on April 13. During the investigation, a law enforcement officer arranged to have him/herself recruited as a TelexFree promoter, to confirm how portions of the TelexFree system operated. On October 15, 2013, an undercover HSI task force officer (“UC”) met with a TelexFree promoter (“Person A”). During the conversation, Person A told the UC that the UC could make $100 a week using an “AdCentral Family Package” to post online ads for TelexFree, and could earn additional money by recruiting other people to join TelexFree. The UC met Person A again the next day, and successfully joined TelexFree as a new promoter. The UC bought the AdCentral Plan for $1,425 (a $50 membership fee plus $1,375 for the AdCentral package), using a check made payable to Person A. Person B, an associate of Person A, helped the UC register and verify the UC’s new TelexFree “back office” account. This consisted of entering a name, date of birth, Social Security number, cellular telephone number, email address, and mailing/billing address. In order to access the back office, the UC created a unique log-in name and password. Starting on October 21, 2013, using the UC’s access to the TelexFree system, an HSI Intelligence Research Specialist placed online advertisements as a promoter for TelexFree. Following the system discussed above, the Specialist copied advertisements created by TelexFree and made available to the Specialist in the back office area of TelexFree’s site, and pasted them to another website TelexFree recommended. As required under the AdCentral Family plan, the Specialist did this five times a day. The entire process took about 25 minutes per day. Between October 21, 2013, and the date of this affidavit, the Specialist posted more than 700 advertisements. The ads have resulted in no retail sales of TelexFree’s VOIP product. As described above, the sites on which these ads were posted contained page after page after page of hundreds of nearly identical ads placed by various TelexFree promoters for the identical VOIP service. The document also asserts the government — once inside TelexFree — used an undercover bank account and tied it to a TelexFree “eWallet” — and began to receive payments from TelexFree. Undercover agents even attended a TelexFree rah-rah fest in Boston on March 9, the day TelexFree announced a new compensation plan. That plan, according to documents, led to an effective storming by affiliates of TelexFree headquarters in Marlborough on April 1. See April 3, 2014, PP Blog editorial. Bail information for Merrill was not immediately clear. Wire-fraud conspiracy is punishable by up to 20 years in federal prison. The Massachusetts Securities Division has alleged TelexFree was a combined Ponzi- and pyramid scheme that gathered more than $1.2 billion. The SEC also has sued. They better scoop up the rest of the gang before they put on their Nike’s and start running. There are some more in the Boston area too. Quick note: We’ll publish a later story on the alleged money flow. Didn’t want to weigh down the story above with heavy math. Reminds me very much of one of the first affidavits in the AdSurfDaily Ponzi case in 2008. AP report says Merrill’s bail hearing won’t be until Monday. Until then, he can sit in the cooler. Law360, New York (May 12, 2014, 6:27 PM ET) — The co-owner of bankrupt TelexFree Inc., which authorities have accused of running an elaborate $1.1 billion pyramid scheme, is not a fugitive and plans to fight the criminal charge against him, his attorney said Monday. Not sure how true this is, this is the only report I can find so far. I wanted to know where is the meeting today about Telexfree in Boston? Gabriel Forero: I wanted to know where is the meeting today about Telexfree in Boston? Not sure what meeting you are talking about, Gabriel. A status conference in the criminal case against James Merrill and Carlos Wanzeler was scheduled for tomorrow. Merrill’s attorney asked it be delayed until Nov. 6 or a later date because of a scheduling conflict. The prosecution did not object, but the judge must approve the request.